"Don't touch it.! Don't even point at it." Immortalized in the famous guitar-room sequence of This Is Spinal Tap, Nigel Tufnel's foam-green Fender 6-string bass remains yet to be played. Vintage expert Norm Harris, of Norm's Rare Guitars, to determines from the instrument's serial number that it was made in 1966. He adds that, "It's an odd one, because it has clay dot markers." 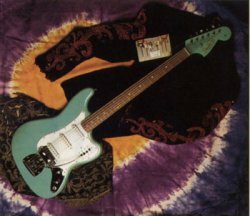 According to the authoritative American Guitars, only 300 or 400 Bass VI's were made from the time of the model's introduction in 1961 to the sale of Fender to CBS in '65. The model was discontinued in 1975. Nigel is as cautious as ever with his prize. He has the bass under round-the-clock surveillance by an armed guard, and to this day resists the temptation to plug it in. "It's kind of a Zen thing," he muses. "Playing it would be kind of like unvirgining a virgin." Nigel does play his main guitars  two Strat-style Tom Andersons [Tom Anderson Guitar Works, 2697 Lavery Ct., Newbury Park, CA 91302]  a bass wood Pro Am, with two single-coils and a humbucker in the bridge position and a lace wood Grand Am, with two humbuckers and a single-coil in the middle. Along with the Andersons, Nigel used some of his finest guitars on Break Like The Wind: his 1946 herringbone Martin D-28, Coral Electric Sitar (both on "Clam Caravan"), Guild 12-string ("Just Begin Again"), Gibson Chet Atkins Solidbody Classical ("Break Like The Wind"), and custom-made Tele ("The Majesty Of Rock"). On the 1961-recorded "All The Way Home," Nigel played a Gretsch Chet Atkins (he doesn't recall the type of amplifier), and on 1967's "Rainy Day Sun" he played a Hofner Verythin through a Vox AC-30. He recently switched to slightly heavier strings (D'Addario 10's) on all electrics, and for his acoustics, he says, "I get these Eclipse strings from Matt Umanov [273 Bleeker St., New York, NY 10014]." For the upcoming tour, Tufnel notes, "I was going to take 150 guitars on the road. About 28 acoustics, 35 Strats  different guitars for different sounds and moods. But it caused a lot of unrest with the roadies, whod'd have to keep them in tune. And just the guitar stands alone cost quite a lot of money. So I've whittled it down to about 50." When reminded that some of the greatest stylists of all time always stuck to one model  James Burton, for example, had his Telecaster, while Lonnie Mack had a FlyingV, Nigel says, "I need the variety. It's like when you go to a party. You talk to one person for a bit, then move on to another. If you went to a party with just one guest, it'd get boring pretty quickly. I don't know Mr. Mack, but I think in his case he just doesn't know that there are any other guitars." Three amp rigs were used on the new album: a Bogner-modified Marshall 800 (on the Dave Jerden-produced tracks), Steve Lukather's VHT/Bradshaw rig (on the Luke-produced cuts), and for the Danny Kortchmar-produced sides, the amp inspired by Nigel himself, Marshall's JCM 900, which goes to 20. Probably the most eye-catching piece in the guitarist's arsenal is the custom-made Marshall stack 6-string pictured on the cover of this issue. Also inspired by Nigel, it was designed by Marshall's Mike Doyle and executed by Jackson Guitars. It features a maple neck-through-body design with bass wood sides (and extension cabinet), ebony fretboard, 22 frets clear, and one Seymour Duncan humbucker. All other parts  cabinet corners, brass rivets, logos, control knobs, white piping, and front and back control panels  are made by Marshall. The "NT" is the only one of its kind  serial number JMOO1. As Doyle points out, "It can be played in either half-stack or full-stack configurations." What does the added extension cabinet do? "What any extension cabinet does," shrugs Nigel. "It makes it harder to pick up." Interview by Teisco Del Rey. from Guitar World, April 1992. &COPY; 1992 Guitar World. Posted with permission.